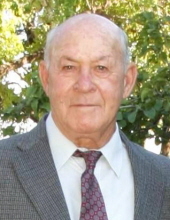 Clarence “Skip’ Laughlin, 85, of Mokane passed away on March 21, 2019, while surrounded by his family. He was born on August 31, 1933 in Jefferson City, Missouri, the son of the late Frank Laughlin and the late Edna Belle (Ramey) Laughlin. He was raised in Frankenstein, Missouri. Skip was united in marriage to Shirley Ann (Barrett) Laughlin, of Union, MO, on February 5, 1955. Skip proudly served his country in the United States Air Force and was a lifetime member of AmVets and the Veterans of Foreign Wars (VFW) Post 2657. Upon return of his service, he owned and operated the Mokane Sand Plant, alongside his brothers, until his retirement. He belonged to Operating Engineers Local 513 and took pride serving many years with the US Military Honor Guard. He truly enjoyed gardening, traveling, bowling, trap shooting, and fishing. He is survived by his children, Rick (Christine) Laughlin of Mokane, Mike (Debbie) Laughlin of Fulton, Gary (Karla) Laughlin of Jefferson City, Pat (Stacey) Laughlin of Mokane, and Mary Kay (Tim) Murphy of Auxvasse; brothers, Sam (Joy) Laughlin of Mokane, Russell (Sharon) Laughlin of Mokane, and Robert “Monk” Laughlin of Fulton; sisters, Margie Sessler of Fulton, and Lois (Bob) Spencer of Mokane; sister-in-law, Peggy Laughlin; grandchildren, Christopher (Kelsey) Laughlin of Kansas City, Paige (Andy) Reece of Nashville, Tn., Molly (Josh) Hanley of Mexico, Kale Laughlin of Jefferson City, Jake Laughlin of Springfield, Justin Murphy & Tanner Murphy of Auxvasse, McKenzie Laughlin of Mokane, Jennifer Dominique (Joey) of Jefferson City, Stefanie (Garrett) Neher of NC, and Tim (Whitney) Ponce of NY,; and great-grandchildren, Carter Laughlin, Logan Laughlin, Jackson Dominique, Marie Neher, Riley Hanley, and Lauren Hanley. He was preceded in death by his wife, Shirley; brother, Charles “Chuck” Laughlin; sisters, Sally Wilson, Betty Lou Laughlin, Mary “Sis” Ward; and long- time partner, Laverne Meuth. Funeral services will be held at 11:00 a.m. on Monday, March 25, 2019 at Maupin Funeral with Father Joseph Abah officiating. Friends will be received from 5:00 p.m. until 7:00 p.m. on Sunday, March 24, 2019 at the funeral home. Interment with Military Honors will be in Mokane Cemetery. Memorial donations are suggested to American Cancer Society, c/o Maupin Funeral Home, 301 Douglas Boulevard, Fulton, MO 65251. To send flowers or a remembrance gift to the family of Clarence "Skip" Laughlin, please visit our Tribute Store. "Email Address" would like to share the life celebration of Clarence "Skip" Laughlin. Click on the "link" to go to share a favorite memory or leave a condolence message for the family.